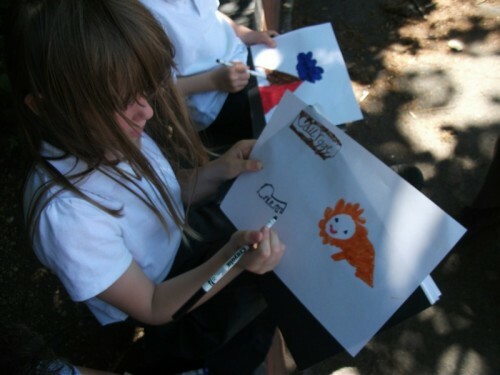 Year 3 Bluebirds had a lovely afternoon creating posters for this month values word ‘courage’. 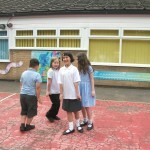 We all went outside to work as it was a lovely afternoon. 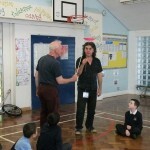 Mr Altariva and the children really enjoyed the lesson. 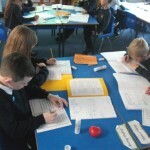 Year 3 Bluebirds learned today in science, how animals move. Mr Altariva gave them a PowerPoint with a list of how certain animals moved and behaved. This was a great cross- curricular lesson because they learned lots of new words, in the ways animals moved, then listed them down in their books. 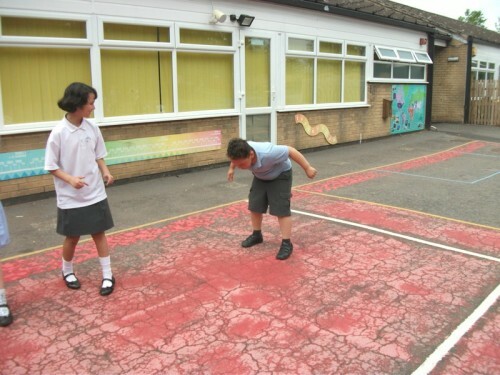 Next, the children were separated into different groups and were told to come up with their own ways of how animals behaved. 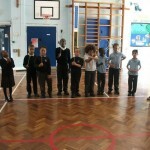 Which, they would then perform in front of the class, in order to guess their actions. 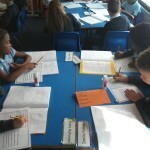 Year 3 Bluebirds had a great lesson in French. 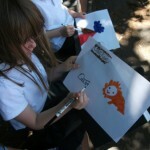 They all played ‘French Bingo’, from their understanding of the animals names, in French. 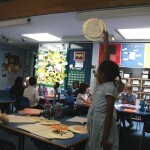 Previously, they had created the animal designs on paper plates. 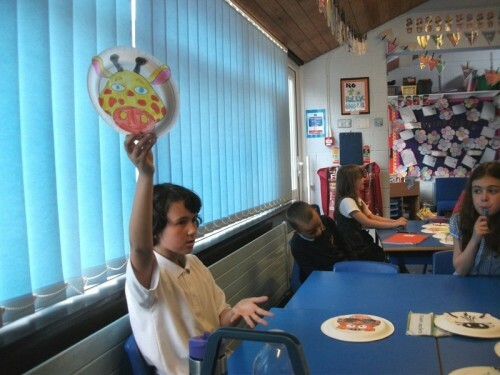 The teacher would then call out an animal name and the first table to put up the correct plate got the point. A fun French lesson. 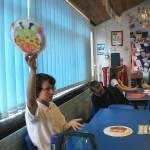 Today Casey and Joshua T went to join Year 4 Robins class in their pottery lesson. 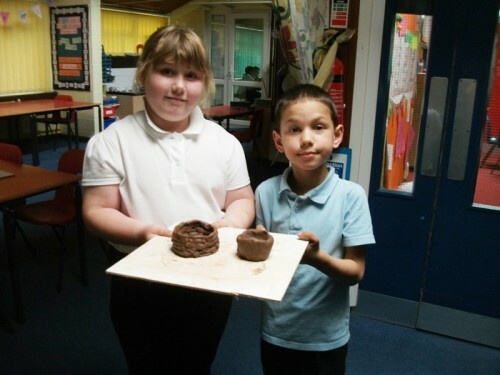 You can see in the photo the lovely pots that they made. 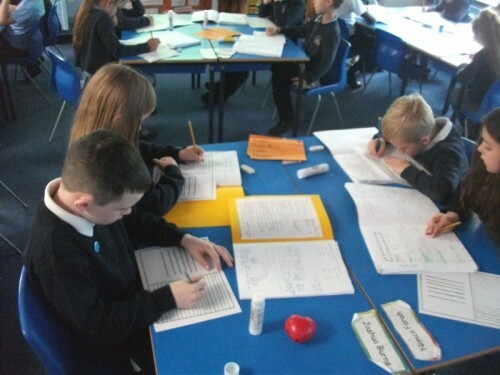 Bluebirds class have been learning how to write fractions as words. 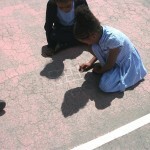 First of all they needed to use their existing knowledge of using simple fractions in shapes. 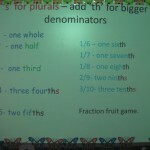 Next, they learned how to say those fractions and then wrote them down as words. 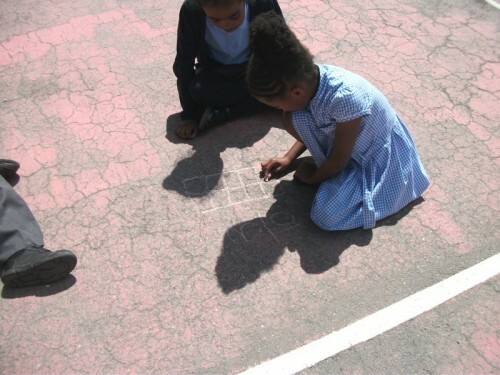 The children then went outside and randomly selected fractions from the top of their heads and asked their partners to draw the fractions using chalk. They then had to write in words what the fraction was next to this. “Maths is really fun”, Hanson. 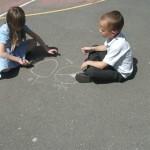 A great lesson outside in this wonderful weather. 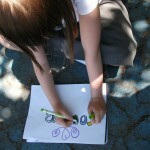 Bluebirds today learned about writing in first person and in the present tense. We have been looking at this story about a meerkat called Sunny, who is fed up with home life and wants to travel the world. Pretending to be Sunny, the class wrote a postcard to their meerkat families, using the correct tense and also in first person. 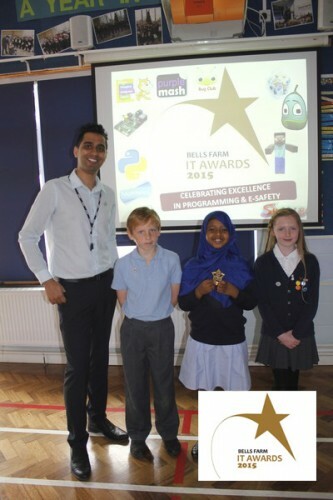 Well done to everyone in Year 3, we won the ‘Blog of the Year’ award at the IT Awards assembly this morning. 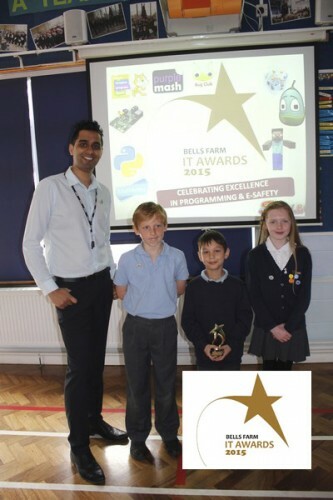 Also, well done to Nimca for winning the ‘Blog Contributor’ award. 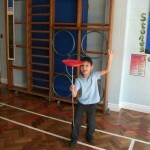 Bluebirds class had some very special visitors, who performed lots of different acts around our new topic, ‘The Circus’. 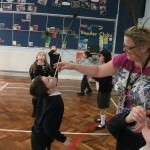 First the children learned to balance a peacock feather on their hand and chin. 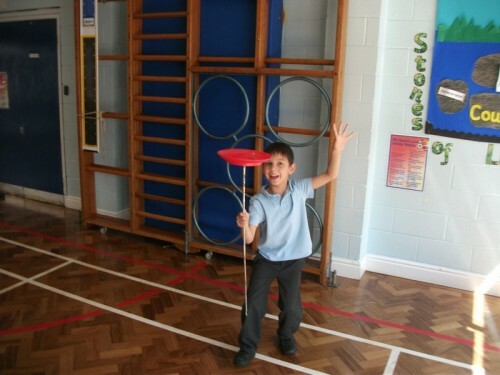 They then had to walk around the room without it dropping, which was a really fun part. 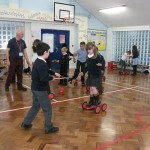 Furthermore, the children learned how to juggle multiple objects and ride on different kind of cycles. 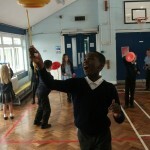 This was a really fun and engaging afternoon, where the children learnt new skills in a positive learning atmosphere. 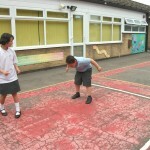 The children had so much fun and a lot of the teachers around the school also joined in. 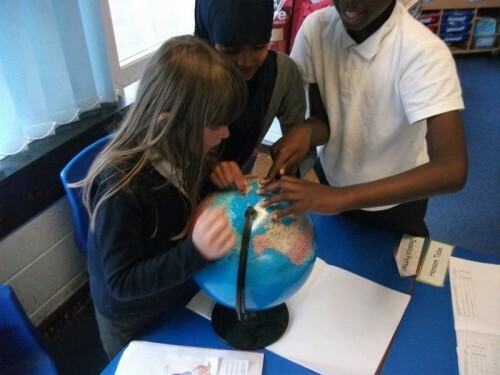 The Bluebirds have been looking at different geographical locations for their topic lesson today. 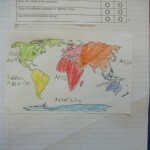 The teacher asked all the children to colour the seven continents, using different colours. 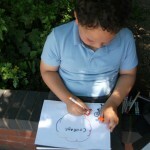 Once they completed that, they would then label them with the correct spellings. 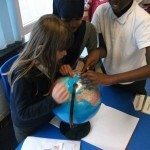 Finally, sir had asked them to find different countries on the globe. Josh T was very excited when he found Cyprus, the country his family was from. 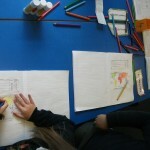 Aisha couldn’t believe how small England looked on the map also.